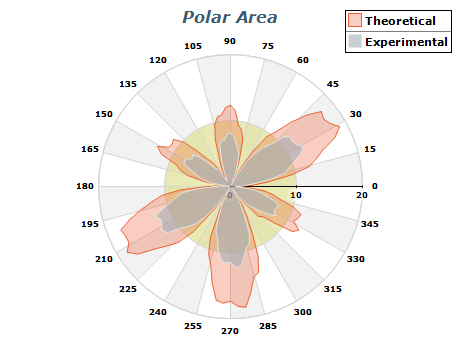 A Polar Area chart displays a filled closed contour in a 2-dimensional polar coordinate system. The contour is defined by a sequence of data points, where the position of each data point is specified by its distance from the center and its angle of rotation. The following figure displays a Polar Area chart. A Polar Point chart displays data points in a 2-dimensional polar coordinate system. The position of a point is specified by its distance from the center and its rotation angle. The following figure displays a Polar Point chart. A Polar Line chart displays a sequence of data points connected by a line in a 2-dimensional polar coordinate system. The position of a point is specified by its distance from the center and its rotation angle. Consecutive points are connected with straight line segments. The following figure displays a Polar Line chart. Here is demonstrated polar angle axes positioning. In this case there are two axes - the first one denoting degree values (red) and the second one denoting grad values (purple). Note that the axes will decorate by choosing a step which is a devisor of the range [0, 90] in degrees ([0, 100] in grads). Here you have two different Value Axes (red and grey). You can dock polar value axes to one of the four cartesian zones attached to the polar - Left, Top, Right and Bottom (in this example - Left and Bottom). You can control the orientation of the axes changing the angle when in cross mode. You can display the value axis reflection using paint reflection option (shown here).